Over the past several years, the US National Science Foundation has been funding the development of collaborative web sites or ‘collaboratories’. Many communities have adopted the HUBzero platform to create collaboratories called ‘hubs’ where they can share ideas, models, experiences, publications, and data in pursuit of research and education. Hubs in different domains leverage the same HUBzero infrastructure to support different toolsets for their own community. In 2009, the NSF George E. Brown Network for Earthquake Engineering Simulation (NEES) moved operations to Purdue and created a hub for the civil engineering community. Today, NEES.org offers more than 65 simulation and data analysis tools used to understand the damage caused by earthquakes and improve building design. 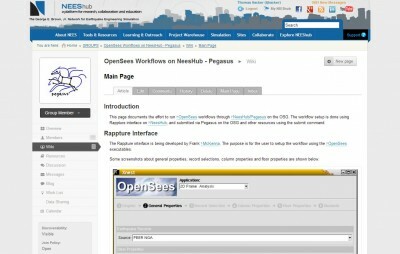 One of these tools leverages an open source code, the Open System for Earthquake Engineering Simulation (OpenSees), to provide a collection of utilities for structural and geotechnical engineers. One of the utilities within this OpenSees Laboratory tool is the Moment Frame Earthquake Reliability Analysis. This tool is intended to demonstrate to engineers the importance of uncertainty in their models and the need to use probabilistic methods when determining important response measures. The tool prompts the user for the material properties including probability distributions, building layout, and then a list of earthquake ground motion records. 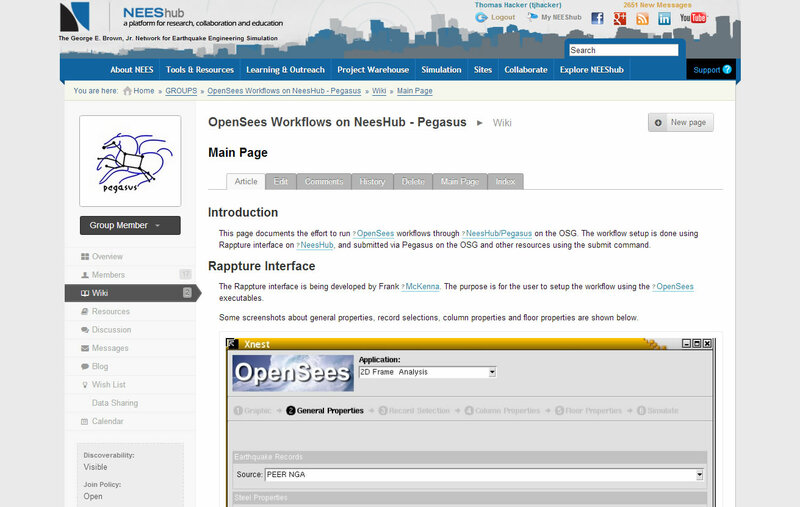 On submission, the tool automatically builds and executes a Pegasus workflow. The workflow manages several hundred to tens of thousands of separate OpenSees jobs on the Open Science Grid (OSG), which together perform a reliability analysis of the building frame under seismic loads. The resulting plots show the variation in roof displacement, interstory drift, and base shear given the uncertainty in the materials for each of the earthquake motions specified. A single dot in red for each earthquake shows the engineer what would happen if only the mean value had been used for the material properties for that earthquake. The advantage of using Pegasus and the OSG for such a workflow is that Pegasus recognizes that most of the computation can be performed in parallel and the OSG permits concurrent job submission and execution. As a consequence, the resulting time spent obtaining these results can be a few minutes and hours instead of many hours, weeks and even months that would be required if the results were obtained from a series of sequential analyses. To date, OpenSees Laboratory has served 950 simulation users from the US, China, Canada, Italy, Japan, and other countries all over the world. About a third of these users are coming from academic institutions. All of them are driving OpenSees through a graphical user interface, perhaps without even knowing if and when they are launching complex workflows.